So convinced is he of the hideousness of having the land overridden with fugitive convicts that he doles out to every bondman (ex-convict) that comes under his lash nearly one-half more punishment than he awards to those who, having come to the country free, have deserted the path of virtue. Galbally, A 1995, Redmond Barry, Melbourne University Press, Melbourne, Vic. In 1878, he sentenced Ellen Kelly, Ned's mother, to three years hard labour for assaulting a police officer, even though the officer's testimony was dubious and Ellen was a deserted wife with a baby. ... society is not bound together so closely as it should be ...' making heroes of criminals required society to condemn felons as beasts of the field with nowhere to lay their heads. Barry then directed the jury to rule out the possibility of a conviction on the lesser charge of manslaughter for Kelly's role in the Stringybark Creek police killings years before, and a guilty verdict was handed down after just over half an hour. Barry sentenced Kelly to death by hanging with the traditional: 'May God have mercy on your soul'. Redmond Barry's reputation as a harsh judge may have been deserved, but Barry had always lived life by the rule of his own opinions, of which he had many. 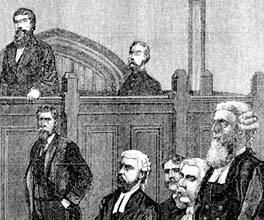 His role in Victoria's early criminal history cannot be forgotten. After Ned Kelly's execution, the 'science' of phrenology offered a window into his mind. Ned Kelly's passionate letter to the press offered a rare insight into his feelings.